Do you want to see your favorite characters fight it out? Thanks to Cosplay Chess now you can! No one knows what could happen as players move their pieces across a giant board. For this 9th year at Otakuthon the theme will be: Classics against Moderns. Entries can come from any sources: manga, video game, anime, etc. The same costume can be worn at the masquerade and Cosplay Chess. The chess pieces will be chosen based on their importance and the influence they could have on the game. After all, this event shares a lot of similarities with a theater play. However, having a popular character does not necessarily guarantee getting an important position. You need to be pre-registered to participate in Cosplay Chess. You will be asked to input you pre-registration number to show that you are duly registered. The participants do not have to make the costumes themselves. All costumes must be appropriate for the general public. Otakuthon reserves the right to cancel any entry that does not comply with this rule. All costumes must comply with the convention's rules. Moreover any and all weapons and accessories must comply with Otakuthon's Weapons Policy. All participants under 18 will need a signed waiver from their parent or legal guardian. You can get this waiver by writing to the Cosplay Chess director at cosplaychess@otakuthon.com. You need to prepare and rehearse a "combat" scene and a "death" scene for the chess game. You may also need several alternate battle scenes in case your chess piece fights more than once during the game. For each scene, you can request help from third parties, but you need to mention it to the Cosplay Chess director beforehand. These people will be considered "support pieces". You can find the necessary information on the subject farther down the page or you can ask one of our staff members who can help you find a battle and/or death scene. No props that disperse are allowed. That means: no confetti, no fake blood, no rose petal, nor anything that might disturb other people's footing. You are required to attend the event meeting before the game. Participants must arrive two hours before the start of the game and not during the two hours preceding the game. Important details that all participants need to know will be covered during this meeting. This is to prevent the chess game from getting too chaotic. Failure to comply with this rule will result in the expulsion of the guilty parties. Other meetings will occur before the convention. They will help those that are not entirely comfortable with the idea of performing in front of an audience develop some confidence in their role within the chess game and with their battle and death scenes. It is highly recommended to attend at least one such meeting. The Cosplay Chess staff works hard to make the event better each year, and the active participation of everyone is greatly appreciated, especially since it is the participants that make the event enjoyable for the public. Details regarding those meetings will follow in a reasonable time frame. This is, after all, only playacting, as such any attack that can arm a fellow player of damage their costumes will not be tolerated. In short, be mindful of the other persons involved. A picture of your character must be submitted with your entry form. Do not forget to include your real name, your email address and the fandom your character is from when you apply (the entry form can be found below). This is to be better able to contact you and give you the details of the event. Also, please indicate which team you wish to join and what position you think your character deserves. When you apply you are making a commitment to participate. If you are suddenly unable to attend Cosplay Chess, it is your responsibility to inform the Cosplay Chess director by email as soon as possible. An unjustified absence will result in being barred from participating in the next year's Cosplay Chess match. You are required to arrive wearing the costume you have registered. Any unjustified last minute costume change will result in your expulsion from the activity. Note: You need to be pre-registered to the convention before you can apply. The participants to the chess game will be chosen amongst convention attendees. No knowledge of chess is required besides the coordinates of the squares on the board (eg: A1, G5, H6, etc.). The two chess players will give you your marching orders. The participants will be chosen amongst the applications received before June 15, 2016. After this date, further applications might be accepted if there are slots left to fill. Be sure to read the rules carefully before sending your application. Can you be contacted via Facebook? You can include other characters in your special attacks or your death scene. Those characters are support pieces. (Attack scene example 1) Naruto (from Naruto) uses Kage Bunshin no Justsu, several Narutos could come help him fight. (Attack scene example 2) Lucy Heartfilia (from Fairy Tail) Asks Loki to fight for her. (Death scene example 1) Link runs toward Zelda after her defeat. He carries her outside of the chessboard while saying: "Well excuuuuuse me, Princess!" Support pieces must be added to the character's application form with their own completed forms. Support pieces are only momentarily on the board. You can also volunteer to help run Cosplay Chess. You only need to send an email to the director at cosplaychess@otakuthon.com. How many people will be chosen? We will select 32 people to be the various chess pieces that will be active on the chessboard. We will also select a number of persons to act as understudies and support personnel, so more than 32 people will have the opportunity to participate. You still have a good chance of being part of the game even if you are on the waiting list! Simply follow the procedure described in the application section. Which team should I apply for? You should apply for the team that best fit your character. So if you are cosplaying a character from a source that predates the 2000s you should go with team "Classics"; if your character made its first appearance after the 2000s go with team "Moderns". It all depends on how the character is interpreted. The Cosplay Chess team can advise you on your choice of teams. We also reserve the right to make changes to the teams' composition if one side is missing pieces. The deadline for application is June 15, 2016. Only completed forms will be kept. All incomplete forms will have to be resent with the missing information before they can be processed. I am under 18. Can I still apply? People under 18 can apply by having a parent or legal guardian sign the appropriate waiver and sending it with the application. Make sure that your parent/guardian knows the time of the chess match so that you are not forced to leave before the end. Also make sure they will be available at all times in case of emergency. Send your request at cosplaychess@otakuthon.com. Is it ok that I didn't make my own costume? Since this is not a contest, the submitted costumes do not have to have been made by the participant, they can have been designed by a tailor or contain pieces sold commercially. 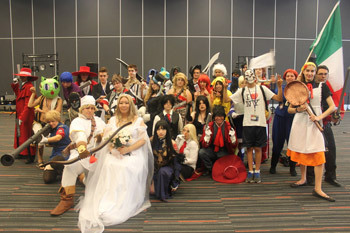 The submitted cosplays can also have been entered in other costumed contests, like masquerades from Otakuthon or other conventions. Cosplays from Otakuthon's masquerade are perfectly acceptable. My costume has moving parts/big weapons/could disturb others. Is it a problem? Participants must be able to move without assistance. The costume cannot impede, obstruct or injure other players on the board. It must fit within a 36 x 36 inches square, since those are the dimensions of the chessboard squares. Everyone selected, including the understudies, will be contacted by email as soon as the decision will be made. You must keep your contact information up to date and check your emails regularly to stay in contact with the Cosplay Chess team. I have been selected! What do I need to do before the convention? Participants will need to exchange frequent emails with the Cosplay Chess staff during the weeks preceding the convention. Failure to communicate with the staff within a reasonable time frame will result in your expulsion from the chess game. You have questions? Contact the Cosplay Chess director at cosplaychess@otakuthon.com or contact your representative player if you have already been selected.